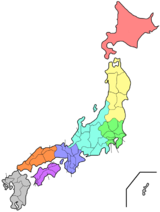 Kōchi Prefecture (高知県, Kōchi-ken) is a prefecture in the Shikoku region of Japan on the island of Shikoku. The capital city is Kōchi. Before to the Meiji Restoration, Kōchi was known as Tosa Province. Kōchi is in the southwestern part of Shikoku. The prefecture faces the Pacific Ocean. Ehime Prefecture is to the northwest. Tokushima Prefecture is to the northeast. Kochi is famous for its clear streams. The most famous stream is Shimanto. The head of the Yoshino River is in Kōchi. Mount Inamura (Inamura-yama) is the highest peak in the prefecture. Its height is 1,506 m (4,941 ft) above sea level. ↑ Nussbaum, Louis-Frédéric. (2005). 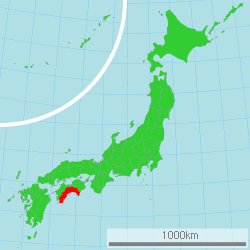 "Kōchi prefecture" in Japan Encyclopedia, p. 538; Japan External Trade Organization(JETRO), Kōchi Prefecture, Regional Information; retrieved 2012-4-6. ↑ Nussbaum, "Kōchi" at p. 538. ↑ Berga, L. (2006). Dams and Reservoirs, Societies and Environment in the 21st Century, Vol. 1, p. 41. ↑ World Index, Imamura-yama; retrieved 2011-211-29. This page was last changed on 31 August 2017, at 05:58.